Modern life is stressful and hectic, and it’s important to take a break from it every so often. So if you’ve ever dreamed of getting away from it all on an island paradise, why not take a look at Aruba. The island of Aruba lies in the southern Caribbean, and is just 19 miles long and 6 miles across. With powdery white beaches, turquoise seas and the friendliest of welcomes, it’s the perfect location for a bit of rest and recuperation. It’s no wonder that they call it One Happy Island. So if your next holiday is going to be all about self-care, here are five reasons why Aruba is perfect for a wellness break. Those who visit Aruba know there’s something special about the island, which makes it the ideal place for a wellness break. It could be the turquoise seas washing over the white sands, or the sound of the trade winds rustling the palm trees. But whatever it is, Aruba is the perfect wellness holiday destination. You can indulge in relaxation at a luxury spa, become one with the waves in a sunset yoga class, or re-invigorate your spirit by kayaking through the mangroves. The best retreats don’t just recharge your batteries; a wellness break on Aruba will allow you to nourish and rejuvenate your mind, body and soul. Beautiful weather is pretty much guaranteed when you take a holiday in Aruba. You’ll be able to enjoy at least 8 hours of sunshine every day, and rainfall is fairly infrequent. 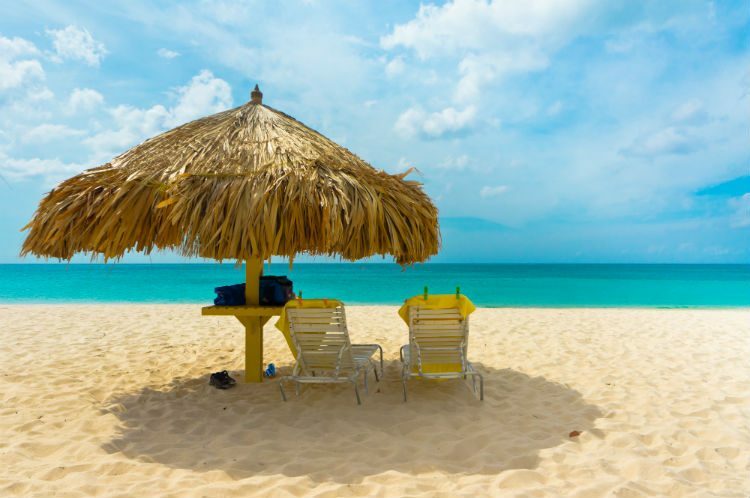 And Aruba’s tropical climate means that the temperature is generally around 29-31C all year around. That means it can get a little humid, but the sea breeze will keep you feeling refreshed. Good food and drink are vital for any wellness holiday, and the food in Aruba is a fusion of global cuisines. Aruba’s rich history has seen it swap hands between the Spanish and Dutch several times over the centuries, and Aruban cuisine has been influenced by more than 90 nationalities. And this heritage comes across in the diverse flavours of Aruban food. You can choose from traditional Dutch pancakes, stew pots simmering with rich Latin and African flavours, and fresh red snapper and barracuda grilled with creole seasoning. And of course, don’t forget to try an ice-cold Aruba Ariba – perfect for sipping by the sea. There are over 250 eateries on Aruba, so you’ll be spoiled for choice. That sounds like a good reason for a return visit! Studies have shown that being by the water is good for your mental health. And there’s nothing quite as relaxing as a stroll along the beach, feeling the warm sand slip between your toes. If this sounds like heaven to you, then you will definitely love Aruba. The One Happy Island has miles of powdery white beaches, and secluded coves flanked by limestone cliffs. Aruba is home to Eagle Beach, which is the third best beach in the world according to TripAdvisor. And if you want to truly get away from it all, you can treat yourself to the quiet solitude of Baby Beach. But if lying on a beach all day isn’t your thing, there’s plenty to keep you busy during your holiday in Aruba. You could try out Stand-up Paddle Boarding (SUP) at Vela Aruba, snorkel the delicate reefs of Mangel Halto or even combine SUP and yoga when you visit Island Yoga for one of their SUP yoga sessions. And at least if you do fall off your paddle board, you’ll be swimming in deliciously warm Caribbean waters. Aruba’s history dates back through the centuries from the island’s ancient Caiquetio Indian roots. After years of Spanish and Dutch rule, Aruba now stands as a constituent country of the Netherlands. And it’s this history that has made Aruba such a beautifully diverse collection of over 90 unique nationalities. It’s a melting pot of people living happily together, offering a friendly welcome to both new visitors and old friends alike. With delicious food, beautiful surroundings and a friendly welcome, Aruba truly is One Happy Island! Great post, I love the sound of Aruba. It sounds like a stunning place to visit and the beaches are amazing – perfect for me. I’d pretty much give anything to be heading to Aruba this summer. It looks and sounds like an incredibly relaxing place. Aruba has been on my travel wishlist for quite a while now. It looks stunning and I would love to see the flamingos there. Oh I have never been to, but Aruba is definitely on my travel wish list, ever since that song about it from the 80’s Lovely photos, makes me want to book a holiday right now! I keep hearing about Aruba everywhere and would love to visit. I’m entering your competition too! That looks like such a beautiful place! I will have to add it to my list of places to visit it sounds amazing! Great post :) I loved all the photos.